ROME, Italy (CNN) -- Barcelona completed an historic treble with a 2-0 win over holders Manchester United in the Champions League final in Rome on Wednesday night. 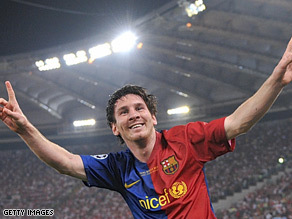 Lionel Messi scored Barcelona's second as they beat Manchester United 2-0 to be crowned Euorpean champions. Goals in either half from Samuel Eto'o and Lionel Messi capped a dazzling performance from the Catalan giants who dominated the showdown in the Stadio Olympico between Europe's top two sides. Barcelona, who are the first Spanish side to win the Primera Liga (domestic league), Copa del Rey (domestic cup) and Champions League in the same season, recovered from a shaky start to show off their own brand of flamboyant, attacking football with Andres Iniesta and Messi at the heart of their play. The victory completed a triumphant first season in charge for 38-year-old Barca coach Pep Guardiola. By contrast, United, who were bidding for their fourth trophy of a previously triumphant season, were distinctly second best in their defense of the title they won in Moscow last year. Alex Ferguson's men enjoyed their best spell in the opening moments with Cristiano Ronaldo testing Victor Valdes with a first-minute free kick which rebounded off the Barcelona goalkeeper and needed the intervention of Gerard Pique to prevent Park Ji-Sung from scoring. Portuguese star Ronaldo was involved again as he chested down a pass in the area and sent a shot skimming across goal and narrowly wide. The shot count stood at five to nil to United after the first ten minutes before Iniesta strode forward and played in Eto'o. The Cameroon international cut inside to elude the challenge of Nemanja Vidic before toe-poking the ball home as Michael Carrick vainly challenged. It was the idea riposte to the early United dominance and Barca were suddenly playing with their usual swagger. Messi and Ronaldo took turns to show their skill with the Argentine blazing a shot over from outside the area which left Edwin van der Sar shaking his head and Ronaldo setting himself up again with neat footwork before sending an effort wide. But it was Barcelona who approached half time in control and Messi underlined their dominance with a surging run which took him away from four players before his shot from an acute angle was partly fumbled by van der Sar. Carlos Tevez came on at halftime for the below-par Anderson, but it did not change the course of the match with Thierry Henry skipping inside Rio Ferdinand and seeing his shot only saved by the legs of van der Sar. Then Eto'o played a dangerous ball across the United area and Messi appealed for a penalty after appearing to be pulled back by John O'Shea. It was still one-way traffic and after Iniesta was pulled down, Xavi's free kick thumped the post with United reeling. The Premier League side's best early moment in the second half came as Wayne Rooney's dangerous cross was nearly converted by both Ronaldo and Park. Dimitar Berbatov came on for United to replace Park but he had barely had a touch when Messi put the game beyond the English champions as he rose unmarked at the far post to head home Xavi's 70th minute cross. United responded by surging forward and Ronaldo was denied by a desperate block by Valdes, but it was still Barca who had the best chances and captain and right back Carlos Puyol was twice denied by van der Sar as his attacking intentions typified the evening.